Cosmic Questions, Our Place in Space & Time « Jeff Kennedy Associates, Inc.
What is the universe like? Was there a beginning to time? How do we fit in to the cosmos? 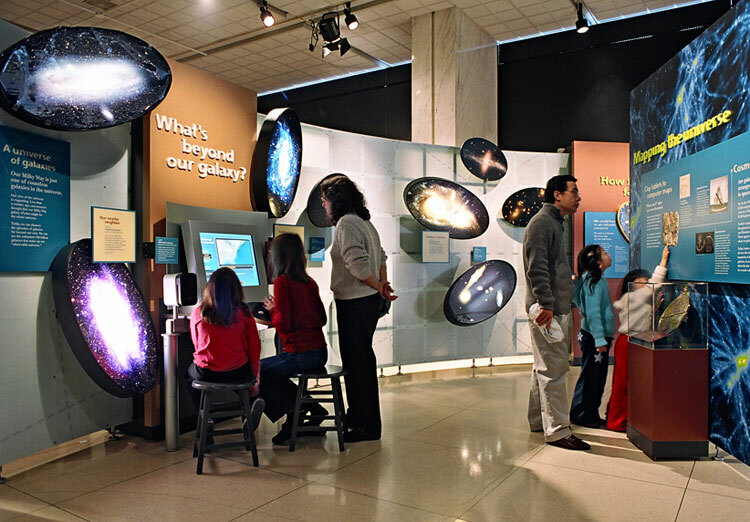 Questions like these, at the heart of this intriguing traveling exhibition, invite visitors to explore their own connections to the universe, find out the latest on unsolved mysteries such as black holes and the existence of extraterrestrial life, and discover what it’s like to be an astronomer uncovering clues from the cosmos hidden in the faint light of distant galaxies. The result is a highly visitor-friendly experience about an extremely complex and difficult subject. 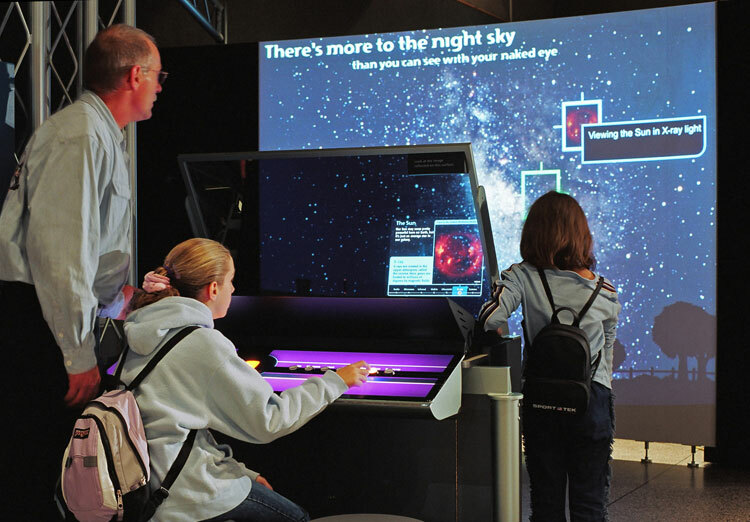 After a successful national tour, Cosmic Questions was permanently installed at the ‘Imiloa Astronomy Center, part of the University of Hawaii, Hilo. 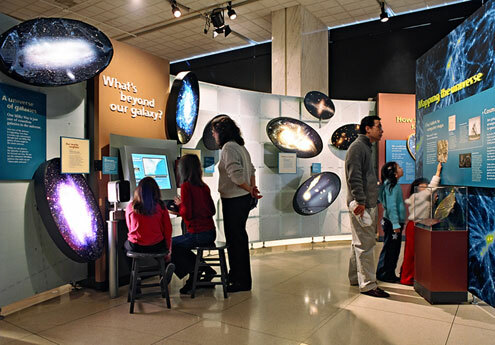 Experiences include a video fly-through of a computer model of the universe, a cosmic ray cloud chamber, tactile models of the Milky Way galaxy and alternate theories of the shape of space-time, and a mini-theater in which spectacular visual imagery creates a quiet space for personal reflection. A large format projected image of the night sky provides the dramatic backdrop for exploration in multiple wavelengths. 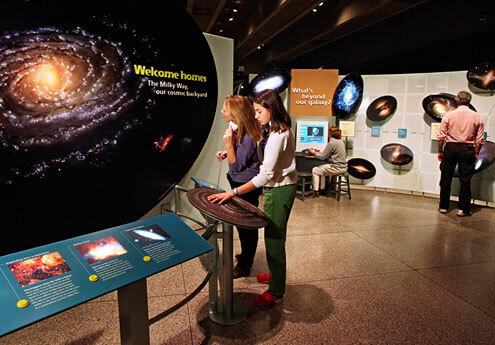 Visitors use a heads-up display to track and zoom in on celestial objects. 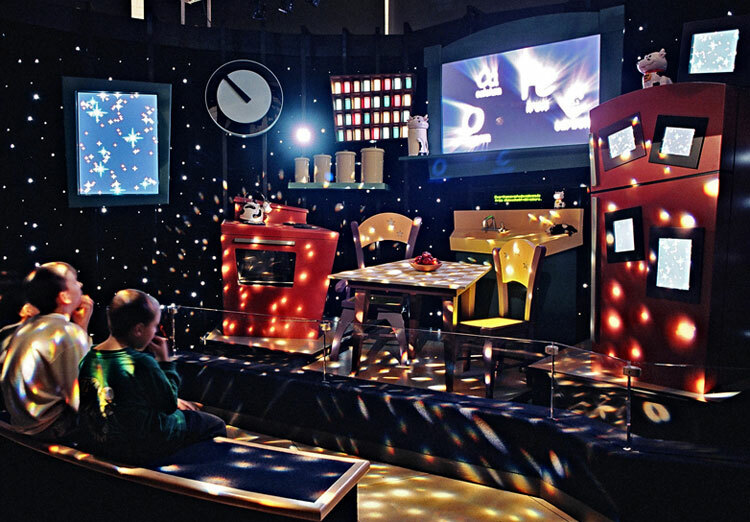 A quotation from Carl Sagan—“To bake an apple pie, first you must invent the universe!”—inspired this 8-minute object theater with a cooking show motif. A highly original set, script, special effects and music bring the story of the universe to life for visitors of all ages.